Both players roll one dice each and the higher roll indicates who is to go first. 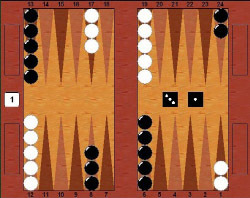 The player throwing the higher number now moves his checkers according to the numbers showing on both dice. After the first roll, the players throw two dice and take alternate turns. The roll of the dice indicates how many points, or pips, the player is to move his checkers. The checkers are always moved forward in the direction indicated in the diagram above. If you are lucky you might roll doubles. This is when both dice are the same and means you can move double the amount. For example, if you were to roll 6 and 6 you would be able to move 6 four times and you may move any combination of checkers you feel is best. You lucky sod. A player must use both numbers of a roll if this is legally possible (or all four numbers of a double). When only one number can be played, the player must play that number. 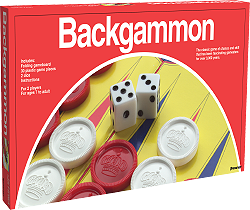 Or if either number can be played but not both, the player must play the larger one. When neither number can be used, the player loses his turn. In the case of doubles, when all four numbers cannot be played, the player must play as many numbers as he can. A point occupied by a single checker is called a blot and if an opposing checker lands on it then this checker is removed from the board and placed on the bar. Therefore it's best to try and keep your checkers in groups of two or more so that they cannot be attacked. If a player has one or more checkers on the bar, they cannot resume playing until they have succeeded in returning their pieces to the homeboard of their opponent. They do this by rolling a number that corresponds to an open point on the opposing home board. If white had two checkers on the bar and rolled a 3 and 4 in the first example they could not move and would lose a turn and in the second example they could return both checkers to play and simultaneously remove an opponents checker to the bar. 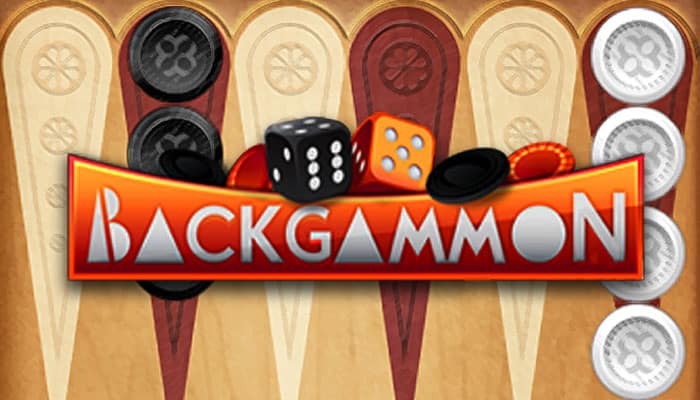 Once a player has moved all their pieces to their home board, they can start bearing off. A player bears off a checker by rolling a number that corresponds to the point on which the checker resides, and then removing that checker from the board. Thus, rolling a 4 permits the player to remove a checker from the fourth point. 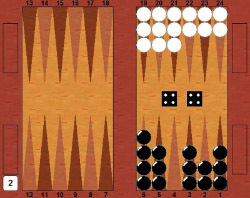 If there is no checker on the point indicated by the roll, the player must move instead by moving a checker on a higher point (in the case of rolling a 4, he could move a checker on the fifth or sixth point instead). If there are no checkers on higher-numbered points, the player is permitted (and required) to remove a checker from the highest point on which one of his checkers resides. The first player to move his or her playing pieces off the board wins the game.